Zanzibar has a long history of lymphatic filariasis (LF) caused by the filarial parasite Wuchereria bancrofti, and transmitted by the mosquito Culex quinquefasciatus Say. The LF Programme in Zanzibar has successfully implemented mass drug administration (MDA) to interrupt transmission, and is now in the elimination phase. Monitoring infections in mosquitoes, and assessing the potential role of interventions such as vector control, is important in case the disease re-emerges as a public health problem. Here, we examine Culex mosquito species from the two main islands to detect W. bancrofti infection and to determine levels of susceptibility to the insecticides used for vector control. Culex mosquitoes collected during routine catches in Vitongoji, Pemba Island, and Makadara, Unguja Island were tested for W. bancrofti infection using PCR. Insecticide bioassays on Culex mosquitoes were performed to determine susceptibility to permethrin, deltamethrin, lambda-cyhalothrin, DDT and bendiocarb. Additional synergism assays with piperonyl butoxide (PBO) were used for lambda-cyhalothrin. Pyrosequencing was used to determine the kdr genotype and sequencing of the mitochondrial cytochrome oxidase I (mtCOI) subunit performed to identify ambiguous Culex species. None of the wild-caught Culex mosquitoes analysed were found to be positive for W. bancrofti. High frequencies of resistance to all insecticides were found in Wete, Pemba Island, whereas Culex from the nearby site of Tibirinzi (Pemba) and in Kilimani, Unguja Island remained relatively susceptible. Species identification confirmed that mosquitoes from Wete were Culex quinquefasciatus. The majority of the Culex collected from Tibirinzi and all from Kilimani could not be identified to species by molecular assays. Two alternative kdr alleles, both resulting in a L1014F substitution were detected in Cx. quinquefasciatus from Wete with no homozygote susceptible detected. Metabolic resistance to pyrethroids was also implicated by PBO synergism assays. Results from the xenomonitoring are encouraging for the LF programme in Zanzibar. However, the high levels of pyrethroid resistance found in the principle LF vector in Pemba Island will need to be taken into consideration if vector control is to be implemented as part of the elimination programme. The Zanzibar archipelago has a long history of lymphatic filariasis (LF), a disabling mosquito-borne disease caused by the filarial parasite Wuchereria bancrofti[1–6]. The mosquito species Culex quinquefasciatus Say, is the most important vector of W. bancrofti in the East African coast and the islands of the Indian Ocean, including Zanzibar, however Anopheles gambiae s.l and An. funestus also play a role in selected areas [7–10]. Cx. quinquefasciatus is a member of the Culex pipiens complex Linnaeus and one of the main subspecies found in Africa [11–13]. It is efficient at maintaining low levels of microfilariae (Mf) within a population, highly anthropophilic, and predominately bites at night. This species is a major biting nuisance, particularly in urban areas where it thrives in wet pit latrines, cess pits, blocked open drains, and polluted puddles. In Zanzibar, W. bancrofti Mf rates have ranged from 0.3% to 20.3% in Culex species [1–3, 6, 7, 14], unpublished data. LF has historically been a significant public health problem in Zanzibar, particularly on the main islands of Unguja and Pemba, where human W. bancrofti Mf rates ranged from 3% to 49%, and clinical manifestations such as hydrocele and lymphodema (elephantiasis) were common [1–6]. The LF programme was established in 1994 and a mass drug administration (MDA) campaign initiated to treat all the eligible population in 2001 [4, 5] following the launch of the Global Programme to Eliminate LF (GPELF) by the World Health Organization (WHO) . Zanzibar was one of the first places in the United Republic of Tanzania and sub-Saharan Africa to target LF elimination and implement six consecutive rounds of annual MDA using a combination of ivermectin and albendazole with the aim of interrupting W. bancrofti transmission [4, 5]. It achieved >80% MDA coverage with a reduction in LF prevalence to 0% Mf rate, and has potentially reached its goal of elimination. However, with no systematic post-MDA surveillance in place it is not possible to fully determine if disease transmission has been completely interrupted. Xenomonitoring presents a cost-effective way of monitoring LF within a population [16–18] and opportunities to collect and examine mosquitoes within existing vector surveillance programmes should be utilised where possible. Assessing the additional impact of vector control and monitoring insecticide resistance is also important in Zanzibar as there has recently been extensive scale up of indoor residual spraying (IRS) and distribution of insecticide treated/long lasting nets (ITNs/LLINs) as part of the Zanzibar Malaria Control Programme (ZMCP), supported by the Presidents Malaria Initiative (PMI) and other international donors [19, 20]. Zanzibar is one of the first places in Tanzania and sub-Saharan Africa to be targeted for malaria elimination, and since 2006 has conducted five rounds of IRS with the pyrethroid insecticide lambda-cyhalothrin . More than 90% IRS coverage has been achieved, protecting over one million people. Free ITNs/LLINs have also been distributed and it is estimated that > 75% of households own at least one ITN/LLIN . It is possible that Culex populations may be affected by the wide use of insecticides and developed resistance even though these species were not being targeted. There is precedent for this in Zanzibar where previous vector control using organophosphate and organochlorine insecticides have been carried out in the 1950s-80s [21, 22] and resistance in Culex and Anopheles species detected [23–26]. Widespread resistance could prove problematic if LF were to re-emerge or be re-introduced from the endemic mainland of Tanzania or Kenya [9, 10], and supplementary vector control using insecticides were required in addition to MDA . Insecticide resistance in Culex species could also impact on the malaria elimination programme if communities perceive a reduced efficacy of IRS and ITN/LLINs and usage rates decline. Given the post-MDA phase and importance of surveillance in Zanzibar, this study aimed to examine Culex species to detect W. bancrofti infection from routine entomological collections and to determine levels of susceptibility to insecticides used in vector control programmes. Blood-fed mosquitoes were collected from the inside of houses using pyrethroid spray catches (PSC) with permission from the village chief and the head of each household. The PSCs are part of routine entomological monitoring by the ZMCP which are carried out every 2 to 4 weeks and collections were made between 0530 and 0930 hours during April-May 2011. For the purpose of this study, only female culicines were used with the remaining males being discarded. Collections were conducted from the following sites: Vitongoji (Pemba) 5 °12'42" South, 39 °49'51" East, Makadara (Unguja) 6 °09'93" South, 39 °11'54" East (Figure 1). 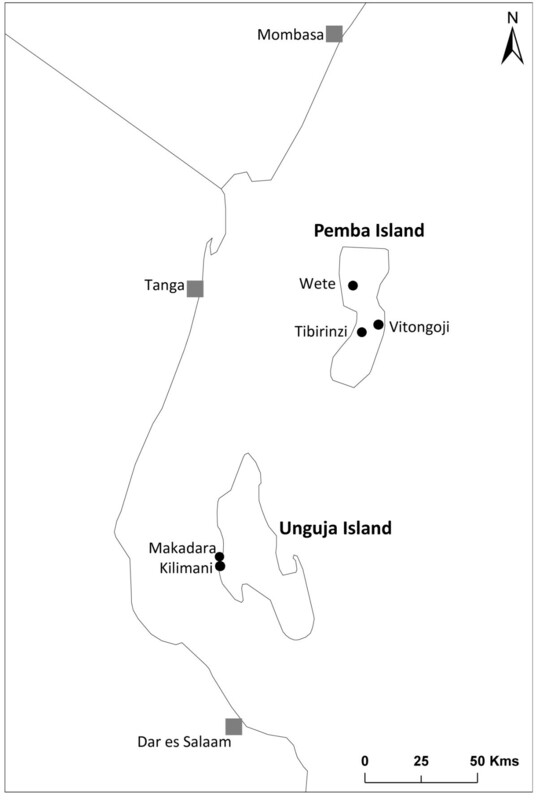 Study sites on Unguja and Pemba Islands, Zanzibar. Genomic DNA (gDNA) was extracted from 226 individual mosquitoes collected from the PSCs using the DNeasy kit (QIAGEN) following the manufacturer's instructions. The presence or absence of W. bancrofti in Culex mosquitoes was detected using the PCR diagnostic described by Ramzy et al. . gDNA from five individual mosquitoes were pooled according to the respective sites and screened. If the pooled sample yielded a positive result, mosquitoes from that pool were screened to isolate the W. bancrofti-positive individual. To confirm any putative positive samples, a melt-curve analysis was conducted using the diagnostic primers from Ramzy et al. . Melt curve analysis is a quantitative PCR (qPCR) assay which determines the specificity of amplified PCR products according to their unique melting temperatures (Tm). The 188 bp amplified product was detected using the Brilliant III Ultra-Fast SYBR® Green Master Mix (Agilent Technologies) on the Stratagene Mx3005P (Agilent Technologies). Real-time PCR reactions were run following a thermal profile of 3 mins at 95°C followed by 40 cycles of 10 s at 95°C and 10 s at 60°C. Immediately following amplification, melt curves were generated by increasing the temperature incrementally from 55°C to 95°C while SYBR® Green is continually detected. The presence of a single homogeneous peak in the melt curve plot (temperature versus first derivative of raw fluorescence) is indicative of specific amplification (characteristic Tm). Culex larvae (L1 to L4) were collected from two sites on Pemba (Wete: 5 °3'21" South, 39 °43'45" East; Tibirinzi: 5 °14'31" South, 39 °45'53" East) and from one site on Unguja (Kilimani - 6 °10'5" South, 39 °12'49" East) (Figure 1). All larvae were transported to the insectaries of ZMCP for adult rearing. Approximately one-hundred non-blood-fed female 2-5 day old adults were exposed to the following WHO insecticide-treated papers for one-hour: permethrin (0.75%), deltamethrin (0.05%), lambda-cyhalothrin (0.05%), DDT (4%) and bendiocarb (0.1%). The percentage mosquito mortality was recorded 24 hours later. Control assays were performed throughout the experiment with a minimum of 25 mosquitoes exposed to non-insecticide treated papers. In order to determine the level of lambda-cyhalothrin resistance, time-mortality response assays were conducted from Wete (Pemba) and Kilimani (Unguja). Approximately one-hundred Culex mosquitoes were exposed to lambda-cyhalothrin (0.05%) treated papers for six time points from Wete (30, 60, 90, 120, 240 and 360 mins) and four time points from Kilimani (15, 30, 45 and 60 mins). Control assays using non-insecticide treated papers were conducted throughout. To investigate the potential involvement of metabolic resistance in Culex from Wete, mosquitoes were pre-exposed to the synergist PBO (piperonyl butoxide); a known inhibitor of P450 and esterase activity. Approximately 75 female mosquitoes were pre-exposed to 4% PBO-treated papers for one-hour and immediately exposed to lambda-cyhalothrin (0.05%) for a further hour. Mortality was scored 24 hours later and any synergism compared with mortality from assays conducted without pre-exposure to PBO (described above). Cx. quinquefasciatus is a member of the Cx. pipiens species complex and is generally assumed to predominate Culex mosquitoes from Zanzibar [10–14]. The PCR diagnostic described by Smith and Fonseca  uses a series of diagnostic primers to discriminate four members of the Culex pipiens complex plus Cx. torrentium and Cx. pervigilans based on single nucleotide polymorphisms (SNPs) in an intron of the acetylcholinesterase-2 (ace-2) gene. The primers ACEquin (5'-CCTTCTTGAATGGCTGTGGCA-3') and B1246 (5'-TGGAGCCTCCTCTTCACGG-3') amplify a 274 bp diagnostic fragment of Cx. quinquefasciatus. In this study, 1 μl of gDNA from 19-24 individuals from Wete (Pemba), Tibirinzi (Pemba) and Kilimani (Unguja) were added to 20 μl PCR reactions using the Cx. quinquefasciatus specific primers under the following thermal cycling conditions: 95°C for 2 mins, followed by 35 cycles of 95°C for 30 s, 55°C for 30 s and 72°C for 16 s with a final extension step of 72°C for 2 mins. Individuals which failed to amplify after two attempts were classed as 'other' species. To confirm the presence of additional Culex species on Zanzibar, 1 μl of gDNA from a subset of Cx. quinquefasciatus positive and negative samples was used to amplify a ~800 bp region of the mitochondrial cytochrome oxidase I (mtCOI) sequence. mtCOI is a common molecular marker for cryptic species complexes in insects and the universal primers used to amplify this region have been described elsewhere . The PCR product was purified (QIAquick PCR-Purification kit; QIAGEN) and sequenced in both the forward and reverse direction using the reaction PCR primers by Macrogen Inc. (Amsterdam, Netherlands). Sequences were analysed and aligned in CodonCode Aligner (CodonCode Corporation, Dedham, MA) and compared with other Culicine mtCOI sequences from an independent study at LSTM (D. Weetman pers. communication). Unique sequences were submitted to GenBank. Genomic DNA was extracted from mosquitoes exposed to lamda-cyhalothrin (0.05%) for 240 mins from Wete using either the DNeasy extraction kit (QIAGEN) or the 'Livak' protocol described previously . For the Livak method, individual mosquitoes were homogenised in 100 μl of pre-heated (65°C) Livak buffer  and samples incubated at 65°C for 30 min. Potassium acetate was added (14 μl of 8 M stock) and the samples incubated on ice for 30 min. The supernatant was collected following centrifugation (13,200 rpm for 20 min) and mixed with 100% ethanol at 13,200 rpm for 15 min. The DNA pellet was washed in 70% ethanol, air-dried for 1 hr and re-suspended in 100 μl of sterile distilled water. A pyrosequencing assay was used to determine the genotype at position 1014 (kdr site) in the sodium channel . The assay detects one of three potential nucleotides (A/T/C) at the third position in the 1014 codon . In brief, a 154 bp region was PCR-amplified with forward and biotinylated reverse primers (Table 1). The sequence analysed to detect the genotype at 1014 was 5'-TT[A/C/T]GTCGTGAGTATTCCAG-3'. Pyrosequencing reactions were performed using the PyroMark Gold Q96 Reagents Kit (QIAGEN) on the PyroMark Q96 system (QIAGEN). The relative heights of the bioluminescence peaks for each nucleotide were used to genotype each individual . Resistance to carbamates and organophosphates in Anopheles and Culex mosquitoes is associated with a mutation (glycine to serine at position 119 or G119S) in the ace-1 gene encoding acetylcholinesterase (AChE) . The presence of G119S in Culex mosquitoes from Zanzibar was determined using the Restriction Fragment Length Polymorphism (RFLP) assay described by Weill et al. . In brief, gDNA from 20 individuals from Wete (Pemba) and Kilimani (Unguja) was added to a 20 μl PCR reaction using the degenerate Moustdir1 and Moustrev1 primers which amplify a 194 bp fragment of ace-1. PCR products were digested with the Alu I restriction enzyme and run on a 1.5% agarose gel. Exact 95% confidence intervals for knockdown and mortality data from discriminatory dose bioassays were calculated in R for Windows version 2.2. Time response curves and LT50 and LT90 values were generated using Probit analysis in XL STAT. A total of 226 mosquitoes caught by PSC from Zanzibar (150 from Vitongoji (Pemba) and 76 from Makadara (Unguja) were examined for the presence of W. bancrofti (Table 1). None of the wild-caught Culex mosquitoes analysed were found to be positive for W. bancrofti. 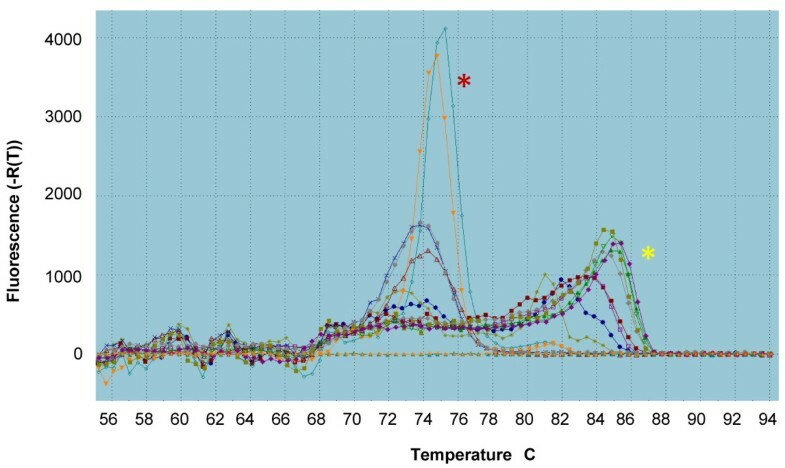 In a separate study conducted in parallel with the data presented here, W. bancrofti infected Culex were identified from Dar es Salaam by both the standard PCR diagnostic  and melt-curve analysis (Figure 2), confirming that the sensitivity of both assays is sufficiently reliable for detecting W. bancrofti from wild-caught mosquitoes. Melt-curve profile for determining the presence or absence of W. bancrofti in Culex mosquitoes. The red asterix adjacent to specific peaks in the melt curve indicates W. bancrofti infected Culex (Tm = 74.3-74.8). The yellow asterix adjacent to non-specific peaks in the melt curve profile indicates Culex mosquitoes free from W. bancrofti infection. Culex mosquitoes from Wete (Pemba) were resistant to all insecticides tested (Figure 3a). Low mortality levels were obtained after exposure of Culex from Wete to pyrethroid or DDT (deltamethrin = 19.4%, 95% CI: 12.3-28.4%; permethrin = 14.0%, 95% CI: 7.9-22.4%; lambda-cyhalothrin = 24.0%, 95% CI: 16.0-33.6%; DDT = 3.2%, 95% CI: 0.7-9.1%). Moderate mortality rates were observed after exposure to the carbamate, bendiocarb (52.4%, 95% CI: 42.4%-62.4%). In contrast to Wete, mosquitoes from the other site tested on Pemba, Tibirinzi, were almost fully susceptible to all three pyrethroids (Figure 3c). Although resistance to DDT was detected from Tibirinzi, this was at a lower level than Wete (46.0%, 95% CI: 33.4-59.1). Culex populations from Unguja were largely susceptible to all insecticides with only deltamethrin giving any detectable level of resistance (86% mortality, 95% CI: 77.4-92.0%) (Figure 3d). Percentage mortality of Culex mosquitoes from Zanzibar following exposure to WHO insecticide treated papers. Percentage mortality and 95% confidence intervals from a) Wete (Pemba) b) Wete (Pemba) with pre-exposure to PBO (4%) c) Tibirinzi (Pemba) d) Kilimani (Unguja). 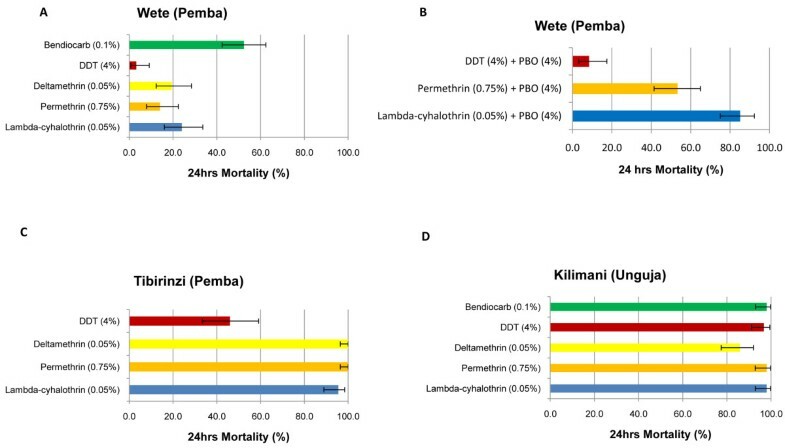 Insecticide resistant mosquitoes from Wete on Pemba were pre-exposed to the synergist PBO (4%) for one-hour before exposure to lambda-cyhalothrin (0.05%), permethrin (0.75%) and DDT (4%). Synergism was evident against the pyrethroids with mortality rising to 53.3% and 85.1% for permethrin and lambda-cyhalothrin respectively while there was no evidence of synergism with DDT (8.5%, 95% CI: 3.2-17.5%) (Figure 3b). This suggests that metabolic (e.g. P450-mediated) resistance may contribute to the resistance phenotype but is not the sole mechanism in Culex from Wete. Assays to determine the LT50 (lethal time taken to kill approximately 50% of mosquitoes) for lambda-cyhalothrin were performed for Culex from Wete and Kilimani. Generation of probit curves for Kilimani Culex were rejected due to the relatively high levels of susceptibility to lambda-cyhalothrin in this population (P > 0.05). However, the estimated LT50 for the Wete population was 199.4 mins (95 CI % = 183.3 - 217.8 mins), demonstrating the extremely high levels of resistance to this pyrethroid. Confirmation of Cx. quinquefasciatus from each of the insecticide resistance study sites on Zanzibar was performed using the method described by Smith and Fonseca . Eighty-four percent of Culex from Wete on Pemba Island (N = 19) were confirmed as Cx. quinquefasciatus. In contrast, only 13% and 0% of the mosquitoes from Tibirinzi (Pemba) (N = 24) and Kilimani (Unguja) (N = 20) respectively were identified as Cx. quinquefasciatus using this molecular diagnostic (Figure 4). A 760 bp region of the mtCOI marker from a sub-set of Cx. quinquefasciatus and unidentified Culex spp. was therefore compared with other available Culicine sequences. All samples sequenced from Wete had a single mtCOI haplotype (GenBank acc. no. JN990140), which was consistent with other members of the Cx. pipiens species complex. Seventy-one polymorphic sites existed between the population from Wete and four distinct haplotypes that were found in Tibirinzi (GenBank acc. no's JN990141-JN990144). The Tibirinzi haplotypes clustered into a separate group when compared with other Culicine mtCOI sequences (D. Weetman pers. communication) and therefore could not be identified to species level. The frequency of Cx. quinquefasciatus from the study sites on Zanzibar. Cx. quinquefasciatus specific primers were used to discriminate this species from samples from Wete (N = 19), Tibirinzi (N = 24) and Kilimani (N = 20). Samples which failed to amplify were classed as unknown 'Culex spp'. Mosquitoes from Wete were collected either (i) following exposure to lambda-cyhalothrin (0.05%) for 240 minutes (dead or alive) or (ii) without exposure to insecticide treatment, for genotyping at the 1014 kdr position in the voltage-gated sodium channel. The wild-type allele (TTA) was absent from all samples genotyped using the pyrosequencing assay. Two variant substitutions at the third coding position of 1014 were identified, both of which result in an amino acid change from leucine to phenylalanine (L1014F), TTT and TTC. Homozygous T/T individuals predominated in this population (genotype frequency = 0.73) with heterozygote T/C and homozygous C/C at lower levels (genotype frequencies = 0.23 and 0.04 respectively). However, since all genotypes encode phenylalanine at 1014, the alternative codons are unlikely to have any impact on the phenotype. Indeed, there was no apparent difference in the frequency of each genotype between survivors and dead from insecticide treatment or between those unexposed (Table 2). Twenty Culex mosquitoes were screened for the presence of the G119S mutation in the ace-1 gene from Wete and Kilimani. Three heterozygous individuals were detected from Wete (frequency of 119 S = 0.08) while no resistant genotypes were found in the samples screened from Kilimani suggesting insensitive acetylcholinesterase may play a partial role in the carbamate resistance observed from Wete. This study examining W. bancrofti infection in Culex species from the two main islands of Zanzibar in the post-MDA phase of the LF Programme (now incorporated into the Neglected Tropical Disease (NTD) Programme) , provides valuable information on the main vector. However, to fully confirm the interruption of LF transmission, it would be necessary to increase sample sizes significantly, and extend xenomonitoring activities over time and space in accordance with current recommendations , and with the support of national entomologists, scientists and vector control programmes. Synergies between LF and malaria vector control activities are encouraged by WHO , and the Zanzibar NTD Programme is well placed to take advantage of the routine surveillance carried out for malaria by the ZMCP, where thousands of Culex mosquitoes are collected at sentinel sites each year. Systemic testing of W. bancrofti in Cx. quinquefasciatus may provide early warning signs of recrudescence or re-introduction from the endemic mainland where human travel is frequent , especially as there is evidence that antigen carriers may have re-emerged on the islands and PCR positive mosquitoes have been detected in other locations in recent years (unpublished observations). Systematic surveillance could help to target further interventions if required, including vector control. The extent to which IRS and ITN/LLIN activities for malaria have played a role in reducing LF prevalence or maintaining <25% Mf rates in Zanzibar is unclear. However, the concurrent scale up of malaria vector control with the sixth and final round of MDA for LF may well have increased the impact on W. bancrofti transmission at the time [19, 20, 36, 37]. The use of IRS and ITN/LLINs in other countries in Africa [38–40] and the Pacific [41–43] have been shown to be effective in reducing LF prevalence, however transmission was by Anopheles vectors, and predominately in rural areas. Effective vector control of Cx. quinquefasciatus in urban areas of Tanzania has been achieved through environmental improvement, larval source reduction, application of polystyrene beads and use of insecticides [8, 11, 44–48]. For example, previous studies in Zanzibar have shown significant reductions of W. bancrofti infection rates in both human and Cx. quinquefasciatus by using polystyrene beads in wet pit latrines . In Zanzibar and Dar es Salaam, larviciding with chlorpyrifos was used effectively in flooded pit latrine and septic tanks during the 1970s-80s, however resistance to this insecticide was detected after a number of years [23, 24, 44, 49]. None of these methods are currently being employed in Zanzibar. This is the first study we are aware of to document insecticide resistance levels in Culex species from Zanzibar in the last three decades. Organophosphate resistance has been previously reported in Cx. quinquefasciatus from Zanzibar [23, 24], and pyrethroid, organophosphate and carbamate resistance in Cx. quinquefasciatus from Tanzania mainland [44, 50, 51]. Here, strong resistance to all insecticide classes tested were found in Cx. quinquefasciatus from Wete on Pemba Island, whereas relative susceptibility was found in the nearby site of Tibirinzi (Pemba) and in Kilimani on Unguja Island. Comparing resistance between these sites is not possible given the unexpected finding that the majority of Culex caught from Tibirinzi and Kilimani are apparently not members of the Cx. quinquefasciatus complex. Unfortunately, morphological identification was not performed on these species and hence their identity and behavioural patterns remain unknown. It is possible that these species do not enter houses, and are thus not affected by IRS, which may explain their lack of resistance. The high levels of resistance in Cx. quinquefasciatus may be related to the current malaria control activities in Zanzibar. Two variants of the kdr 1014 F allele were detected from all Culex sampled from Pemba, both of which result in a leucine to phenylalanine substitution at codon 1014. This substitution is strongly associated with pyrethroid and DDT resistance in An. gambiae s.l. . The A-to-T mutation has been reported from different members of the Cx. pipiens complex including pyrethroid resistant Cx. quinquefasciatus from West and East Africa [50, 53–55]. The second mutation, an A-to-C substitution, was found at a lower frequency from Wete and has been previously documented from Cx. quinquefasciatus from Sri Lanka  but not from the African continent. The fixation of 1014 F in the Wete population and cross resistance with DDT, suggests that selection pressures have been acting against kdr for some time. The historical and extensive use of DDT in IRS during the 1950s-80s [21, 22], local agricultural usages and/or extensive use of pyrethroids in malaria control [52, 56], could all feasibly play a role in selecting for kdr in Culex from Pemba. The synergism with PBO however, indicates that other mechanisms, such as P450-mediated detoxification, may also be contributing to the observed resistance patterns. Whatever the mechanisms involved, the strong levels of pyrethroid resistance in Cx. quinquefasciatus from Wete (LT50 = 199.4 mins) could have broader implications for the control of all vector-borne diseases on Pemba Island, particularly if it reduces community engagement in vector control programmes. Furthermore, the presence of bendiocarb resistance (52.4% mortality) together with 119 S in ace-1 in Wete, albeit at a low frequency, means that switching to a carbamate-based vector control strategy, may not extensively suppress Culex from this area and indeed, potentially select for further resistance. Insecticide resistance in Cx. quinquefasciatus is of concern for the NTD Programme if insecticide-based control methods are considered as an intervention in the future. However, this is unlikely in this setting given the effectiveness of the current drugs used for elimination . Moreover, further rounds of MDA in combination with alternative vector control methods such as polystyrene beads may be more effective and practical if LF were to re-emerge as a public health problem in Zanzibar. Christopher M Jones, Camille Machin contributed equally to this work. Thanks go to Dr Greg Devine from the Ifakara Health Institute, Tanzania, for introducing us to the study sites and assisting us in the field. We are grateful to Matthew Daley form the Liverpool School of Tropical Medicine (LSTM) and other members of the Zanzibar Malaria Control Programme (ZMCP) for their assistance in the field and laboratory, and also to Dr Dave Weetman (LSTM) for his advice on the mtCOI Culex spp. sequencing. Finally, we appreciate comments on the manuscript from Prof. Moses Bockarie (LSTM). The study was supported by a grant from the Department for International Development (DFID) and GlaxoSmithKline (GSK) for research on the elimination of lymphatic filariasis. LKH and HR conceived the study. CM, CMJ, KM, SM, BK, JM and AA carried out the field work. CM, CMJ and HR designed and performed the lab experiments. CM, CMJ, HR, and LKH analyzed the data, interpreted the results and wrote the first draft of the paper. All authors read and approved the final manuscript.